When an artist approaches a creative process with authenticity, every project presents an opportunity to grow and learn. For Kyle Bean, much of what he creates is rather broad. He’s generally brought on to solve large creative problems in a visual process, but every now and then he has a collaboration that has more defined boundaries. His latest, with Kiehl’s was one of those jobs and it opened up new doors, even within its constraints. 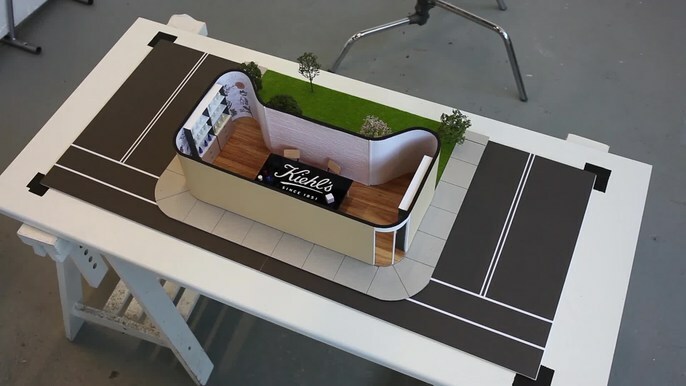 “What I found quite appealing about this job was that what I was tasked with almost creating something between an architectural model and an illustrative representation of a Kiehl’s store,” explains Kyle. “Normally, I don’t normally have that much of a brief when I’m given a job to make one of my artworks, so it was a bit more specific in that they wanted there to be lots of references to what you find inside a typical Kiehl’s store like their flagship store in New York.” Those details included the pear tree that sits outside the Kiehl’s store on Manhattan’s East Village location on 3rd Avenue, a Mr Bones skeleton, a motorbike, the little compartmentalized drawers where the product sits. But above all else, literally, the entire store was set in the shape of Chinese retailer TMall’s logo. The project was created to celebrate Singles Day, a holiday in China that celebrates folks who are romantically unattached. Every one of these confinements was an opportunity. “Every job I learn something new, even if it’s something simple. On this job I was using a bit of a mix of materials in a way that I wouldn’t always use or combine in some of my other work,” Kyle says. “With the motorbike I used a weird combination of oven drying and some painted wooden dowels. What I found quite liberating with this job is I could kind of just find materials that I felt could work for different parts of the model and not feel constrained.” Every limitation offers an opportunity for expansion, and with this project for Kiehl’s, Kyle was able to use every square inch to broaden his process.